Rising Voices note: This tribute post was written by Janet Feldman, upon learning about the death of Dennis Kimambo of the Rising Voices grantee project REPACTED on April 29, 2013. At the time of publication, the circumstances surrounding his death are still being investigated. 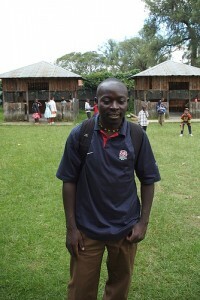 When I first heard the news that Dennis Kimambo had been missing for over a week, I was worried, but envisioned him in a rural part of Kenya, conducting an HIV/AIDS educational outreach, or in Dubai, where he had been invited at one point to play in a golf tournament, one of his favorite pastimes. After the news came that his body had been discovered on April 29, and that he had met a violent death, I could not fathom or accept it. Stan Tuvako, a close friend of ours and the person who actually introduced us, said in the aftermath of the announcement: “it was shocking how much violence this man of peace encountered.” That this courageous soul faced violence and death again and again over the decade I knew him, and continued to do the work for which he seemed born, was just one of the remarkable qualities we so loved and admired in him. Dennis had a motto: “humanity before politics.” During the 2007-2008 post-election conflict in Kenya, which threatened to spiral into civil war, Dennis and many others faced threats to their lives and safety on a daily basis, yet continued to reach across political and cultural lines in attempts to quell the violence and encourage tolerance, understanding, and cooperation. I knew Dennis virtually for many years before we met in 2007, the only time I would ever see him in person. Our relationship was forged via email and phone, and built on several mutual passions, including the use of arts and media to address HIV/AIDS and health issues, the empowerment of young people, and the peaceful resolution of conflict. I was a mentor in the beginning, but felt like a student myself as he forged ahead in the many forms of activism that distinguished his brief but meaningful life. Dennis began his career in several youth groups based in his hometown of Nakuru, Kenya. After we met, he became one of the mainstays in the ActALIVE arts coalition I founded in 2002, whose mission was to bring together artists and others using creative approaches to health and development issues, specifically focusing on HIV/AIDS. In 2001, Dennis and young theatre artists from the Nakuru Players Theatre Club founded the theatre-for-development nonprofit, REPACTED (Rapid Effective Participatory Action in Community Theatre Education and Development), which uses a new and unique form of audience participation and interaction–called “magnet theatre”–to educate young and old, women and men, prisoners, and people already HIV-positive on health issues, behavior change, stigma and discrimination, and self-empowerment. The “Mr. and Miss Red Ribbon” contest, held each year on World AIDS Day (December 1), is an innovative beauty pageant emphasizing the importance of self-esteem and healthy lifestyles for those who are HIV-positive. Several other opportunities emerged that would carry Dennis and his peers in new directions, including a grant from the MTV “Staying Alive” Foundation that funded HIV/AIDS education and prevention efforts among the male and female inmates at the prison in Nakuru. 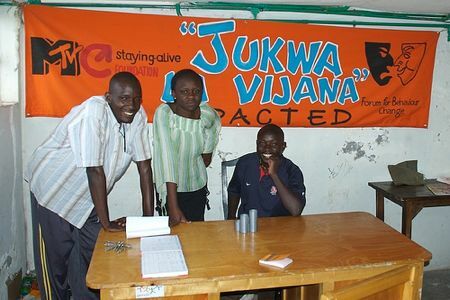 The grant also allowed community-theatre outreaches to young people to educate them about HIV/AIDS, encourage use of prevention measures, and promote voluntary counselling and testing (VCT). Dennis (on the right) and colleagues at the REPACTED offices in Nakuru. Photo by David Sasaki and used under a CC BY-NC 2.0 license. Dennis and other members of ActALIVE in Kenya, India, Thailand, Nigeria, USA, Uganda, South Africa, and elsewhere became involved in 2005 in the first World AIDS Day activities of the Global Peace Tiles Project, an arts endeavor using collaged tiles as a means to convey messages about peace, health education, HIV/AIDS prevention, and sustainable development. In 2007-2008, Dennis and other peace activists in Kenya faced perhaps their greatest challenge to date: quelling the violence that was threatening to kill thousands and destroy the fabric of Kenyan society. He and a group of Kenyans and others from around the world, myself included, became involved in a project called “Pyramid of Peace,” a name coined from an acrobatic act created by the Nafsi Afrika Acrobats based in Nairobi, whose theme is peaceful co-existence among the various tribal groups in Kenya. 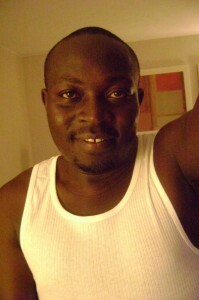 Dennis Kimambo. Photo by David Sasaki and used under a CC BY-NC 2.0 license. The Pyramid of Peace, created under the auspices of the Lithuania-based think-tank Minciu Sodas, helped members in Kenya to confront violence and seek peaceful resolution to conflict. One unique feature of this endeavor was the use of cellphone credits to help us communicate with each other and also to distribute within areas of conflict to the various factions. Dennis credited this approach with saving his life at one point, when he was confronted by an angry mob. REPACTED began to incorporate the use of information and communication technologies (ICTs) during this time, and the two Rising Voices grants the group received helped immensely to increase and improve their efforts. The first grant enabled the purchase of equipment (video and photo cameras, a computer, and a modem) that allowed REPACTED to introduce a group of 27 young people to the digital world. Blogging was a focal point, and this resulted in invaluable participation in RV's “Blogging Positively” project, which has produced an e-guide, a map of bloggers who write on HIV/AIDS themes, and follow-on discussions about next steps, such as development of a curriculum. The Rising Voices grant also allowed REPACTED to organize a Youth Media Consultative Forum, to train local residents to gather news and stories and share them with an international audience. Various forms of citizen media were envisioned and used in this project, and magnet theatre formed a central part of these efforts. In addition, REPACTED helped Kenyans displaced by the civil disruptions of 2007-2008 to tell their stories, and in more recent times has organized civic-education activities regarding elections, voting, and constitutional matters, all in hopes of ensuring that history does not repeat itself. The REPACTED weblog at RV contains four years (2007-2011) of informative and insightful postings about the group and their work. “Denno,” as his friends often called him, has been described in recent days as a loving father, a wonderful husband, a leader of great vision, a cherished friend, a person of “light,” a force for good, an activist who helped change hearts and minds. He had the dreams of a Martin Luther King, and the courage and determination of a Gandhi. He was a hero to so many of us, and he will be always. Thanks so much for teaching us how to live, to give, and to love, Dennis! You were and always will be a man for times like these, and what you gave to the world will be remembered and cherished time and time again.